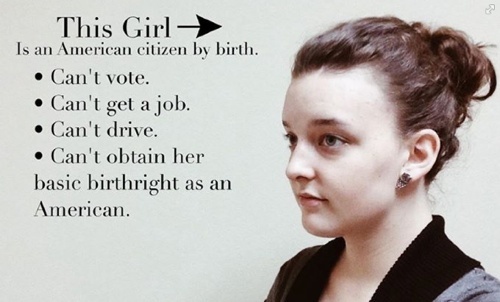 News: 19-year-old Alecia Faith Pennington claims she cannot prove her natural born citizenship due to parents' off-the-grid beliefs. This leaves me with nothing to prove my identity or citizenship. I am now 19 years old and I’m unable to get a driver’s license, get a job, go to college, get on a plane, get a bank account, or vote. 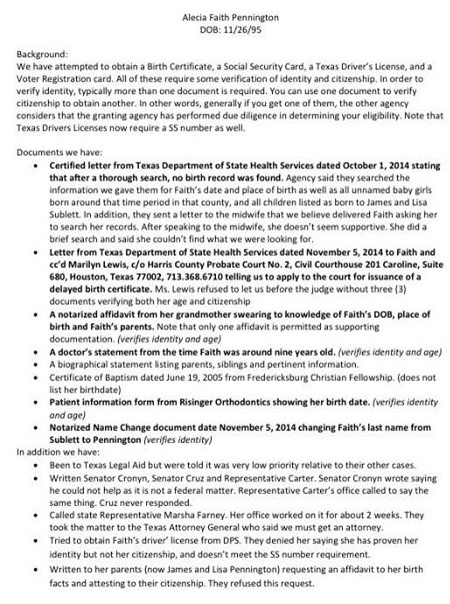 no birth certificate was issued. She claimed her parents never filed for a Social Security number on her behalf, and that she never attended any school (public or private). Furthermore, Pennington said she was never hospitalized and thus lacked the medical records that would have been generated had such a visit occurred. On Wednesday, September 24th my life was changed forever. My 18 year old daughter left home. She gave us no warning, no signs that it was coming. She didn’t try to talk to us about it or work with us. She, with the help of my parents, just left. And with her she took pieces of my heart that had been torn to shreds. I cried harder that day than I ever knew was possible. So hard that it scared my little boys and I had to go in my closet and put a pillow over my face to muffle the sobs. We did have a meeting with our daughter about a week after she left and it became obvious when we agreed to give her everything she was asking for that she did not intend to come home. She had sent us a list of things she wanted to change at home, but because we agreed to all of the changes and she still won’t come home … it seems there must be something deeper there that she isn’t telling us. Sadly, Alecia is not alone in her predicament. According to HARO’s 2014 Survey of Adult Alumni of the Modern Christian Homeschool Movement, out of 3703 respondents, 3.65% (or 135 respondents) experienced some form of identification abuse. Numerous testimonies from homeschool alumni denied identification documents can be seen at the Coalition for Responsible Home Education’s website.